So long, Pollock! See you later, Franz Kline! On April 18, UTSA students Raul Gonzalez, Jose Cardenas and Rafael Gutierrez, dressed in homemade costumes, slugged it out at High Wire Arts in San Antonio, in front of a live audience. Inspired by Ushio Shinohara’s boxing paintings, the performance, organized by Gonzalez, a graduate student, mixed boyish roughhousing, Lucha Libre, and WWE spectacle. Although it was billed as “a re-approach to action painting,” War Paint was more about un-painting: no fewer than seven canvases (and an innocent poster) get trashed during the brawl. This summer, Gonzalez plans to clear out his UTSA studio, and stage some performances that involve more actual paint, and less macho posturing. Art-sports spectacles are proliferating like NFL playoff slots: last August, Dallas was alternately enlivened and enraged by Captain Kiser’s Thumb in the Eye Wrestling Federation performance, part of the DallasSITES exhibition at the Dallas Museum of Art, which used similar WWE-inspired staging. On September 13, new UTSA professor Christie Blizard is planning a mud-wrestling event at the Epitome Institute in San Antonio, and has advertised on Craigslist for opponents who look like abstract expressionists. She’s already signed up and a deKooning (sorry!) but is still looking for Lee Krasner or Joan Mitchell. Rafael Gutierrez is a UTSA undergraduate in new media. Jose Cardenas is a BFA sculpture major. Raul Gonzalez, and event organizer, is a graduate student at UTSA. If the cost of tuition was doubled, it would put an end to this nonsense. Ben, I think you mean “If they lowered the tuition” this nonsense would stop. Ha. M. Sonic, that is happening this summer. We couldn’t get the approval for this location. I have about 8 artists lined up to participate. 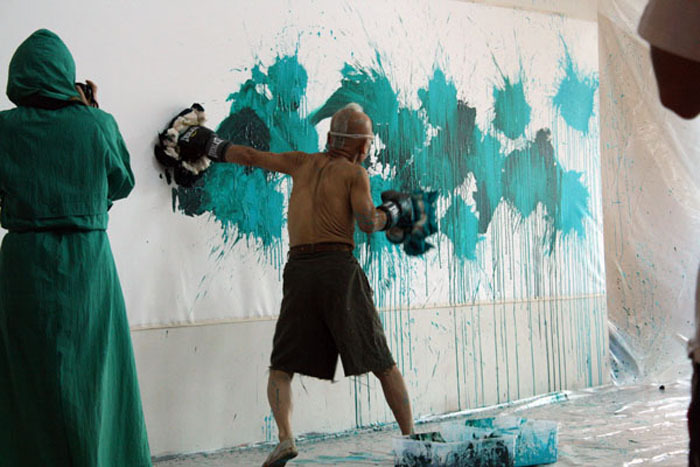 Artists will be able to use paint “straight out of the tube” or take the time to mix it in order to cover their “opponents”. “Splash Zone” plastic cloths will be used for a future gallery show later this year. Seems all visual art has become spectacle and entertainment. These students are being cheated if they are taught this activity is aesthetically relevant, and of some substance to their artistic careers. At this level they are candidates for Jimmy Kimmel or the Tonight Show. Pollock was laughed at when he painted a canvas with a car. Still nonsense verging on irrelevance.